A Sotheby’s art expert who gave up her career to find meaning in life found what she was looking for in the Himalayas and is now on a mission to sow seeds of happiness. 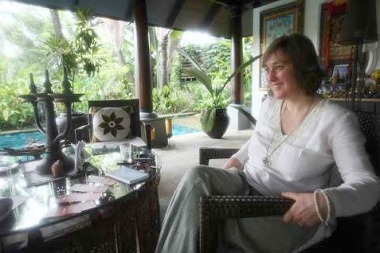 Kuala Lumpur, Malaysia -- ALISON Murdoch, the social worker, is like a happiness guru. The lead author of the book, 16 Guidelines For Life – The Basics is on a quest to help people find meaning in life. << Murdoch, 50, was in Malaysia recently to promote the 16 Guidelines For Life. The 16 guidelines are based on 7th century Tibetan texts and teachings of Tibetan King Songtsen Gampo. “This is ancient wisdom for the modern world,” said Murdoch. “The 16Gs are not just a framework for life but a way of life. People find that they can initiate positive changes when they apply these guidelines. Relationships get better and the workplace becomes more harmonious. They’ve more happiness,” said Murdoch who added that the programme had been introduced in 15 countries. Food for thought: ‘All of us have influence. If you’re grumpy and walk into the office or go shopping, your grumpiness will be passed on and have an effect on other people’s day,’ says Alison Murdoch . The English woman shuffled a pile of 16 Guidelines cards and placed them on the table in the garden patio of her host, Geeta Lachmandas’ lovely house off Jalan Duta, Kuala Lumpur. “Take a card and use it as a theme for the day,” she invited. “You can also take a card when you’re facing difficulties. Say I’m nervous about being interviewed and I shuffled these cards and picked one up. It’s the card that says, Patience. “I say: ‘Patience for me and I appreciate your patience.’ Then I’m more relaxed. Anxiety disappears because I am thinking about the other person,” explained Murdoch. “The way we think shapes reality. The cards are medicine for unhappiness. You’ve to decide to take the medicine. It’s like a game of life. Then Murdoch picked a card and it says: Delight. “Delight is an antidote for envy and jealously,” she explained. “For example, you see a woman with a lovely figure, you feel happy for her. It lightens your life. Murdoch is passionate about the 16 Guidelines. “I know it works!” she enthused. I asked about people who were disillusioned with life. “People who are in prison or are addicted to drugs and alcohol, could fall under this category,” she explained. In the 16 Guidelines book, every guideline has an iconic symbol. “Kindness is represented by Mother Teresa, (Mahatma) Gandhi is Contentment and Desmond Tutu is Forgiveness,” said Murdoch. The 16 Guidelines book, she emphasised, brings people together and is something everybody can understand. For small children and teenagers, there is a version for them, too. “All of us have influence. If you’re grumpy and walk into the office or go shopping, your grumpiness will be passed on (by what you say) and have an effect on other people,” said Murdoch. I enquired about mean people and their actions, and if the book could help them. Murdoch’s explanation provides food for thought. “We would not say someone is mean but that they behave in a mean way. All of us are capable of behaving meanly but that doesn’t mean we’re mean. If we label people as mean, we’re putting them in a prison. That person is not always mean. “If we tell people they’re mean, it takes a lot of energy for them to change. If you say, ‘That is a mean thing to do,’ they’ve an opportunity to change and not do it again. It’s important that we inspire people to change and not put them down. Can the 16 Guidelines help the suicidal? For those who are depressed, Murdoch reminded them that everything changes. People might ask: What’s in it for them if they practise the guidelines? That’s when wisdom comes in, answered Murdoch. And what a choice she made when she quit her job as art expert at Sotheby’s, in search of a more meaningful life. Murdoch had joined the international auction house after graduating from Oxford University with an Honours degree in Modern History at the age of 21. She spent the next one-and-a-half years travelling through Asia and the United States in search of happiness. “I found happiness in Tibet when I met the Dalai Lama!” said Murdoch. Upon her return, she worked with the homeless in London for the next nine years and ran night shelters and day centres. “I interviewed 140 beggars and asked them how they came into that situation. I found the main reason was a breakdown in relationships. From a no-work no-money situation, they eventually ended up homeless,” she said. Today, Murdoch is director of the Foundation for Developing Compassion and Wisdom, a London-based NGO founded in 2005 with the Dalai Lama as its patron. “The foundation is an educational charity to help people develop compassion and wisdom,” said Murdoch. She helped develop a programme called Essential Education which aims to empower children, youth and adults to make a positive difference in the world through developing their capacity to be kind and wise, and to live in a way that will bring peace and well-being to themselves and the people around them. Rooted in Buddhist philosophy and psychology, Essential Education works to create a peaceful world by providing resources, training and connections that enable people to set up such programmes in schools, hospitals, hospices, prisons, the workplace and individual homes. Essential Education’s first programme is the 16 Guidelines For Life. In June 2005, Murdoch was given a Millennium Award from UnLtd, a British charity which supports social entrepreneurs, for her work on Essential Education. Murdoch has travelled extensively to Asia, Australia, Europe and the United States to promote the 16 Guidelines For Life. A devout Buddhist, she is a board member of the Foundation for the Preservation of the Mahayana Tradition (FPMT), an international Buddhist organisation founded in 1975 by Lama Thubten Yeshe and Lama Thubten Zopa Rinpoche. Murdoch was the director of Jamyang Buddhist Centre (1994 -2004) which is affiliated to FPMT. She is also a founder-member of the Faith-Based Regeneration Network and Women’s Interfaith Network in Britain. Murdoch has appeared on numerous radio and TV shows in Britain and is a regular contributor to Pause For Thought and Prayer For The Day on BBC. She is married to Simon Keyes, the director of St Ethelburga’s Centre for Reconciliation and Peace in London. For enquiries on the 16 Guidelines For Life – The Basics, e-mail geeta@eetech.com.my.